Do you (pl. you guys, y'all) think magic in HP is more like its own entity, with its own personality, independent of its users, or more like an emergent property reflecting (with varying degrees of distortion etc.) the personalities (and foibles, and preoccupations, and limitations and hidden gifts) of its users? There it is, an open discussion point for anyone and everyone to talk about this week! Mini-Essay #1: Is Rowling's Magic a Silent Sentience, or an Incognizant Efficaciousness? The way the characters interact with magic mostly seems to suggest Laura's latter option. At the very least, magic allows itself to be shaped by the user. There's the involuntary magic of children, e.g., Harry Vanishing the glass off the snake display at the zoo, or Neville bouncing when his uncle dropped him out of an upstairs window. This sort of thing isn't controlled by the young witch or wizard, but is shaped by his or her need and emotion. There's controlled magic, usually worked through a wand, though goblins and house-elves have power over their magic without wands. These things obviously reflect the personalities, etc., of the users. But then there are magic-infused items like wands and the Hogwarts castle, and it's harder to say how much of that infusion is created by willed wizardry and how much is magic gathering and acting of its own accord. For instance, as it's hopefully not too much of a spoiler to point out, Muggle electronics supposedly go haywire around Hogwarts because of all the magic in the air (this isn't shown, but it's mentioned by Hermione, and she and her photographic memory would probably know). Four people who definitely left some magic lying around Hogwarts. There are talking portraits and moving staircases and trick doors and argumentative chessmen and something of the personality of Rowena Ravenclaw in her House's common room door-knocker, and sure, a lot of this is explainable by means of charms and other spells being put on inanimate objects, but is all of it so easily explained away? Masha is exactly right about Hogwarts: there's "a sense of humor in the castle, as though thousands of laughing wizards have left their joy hidden in nooks and crannies." Some of it was obviously deliberately left by the wizards, but some of it seems to be simply their magic embedding itself in the places they frequented. Possibly the strongest argument for magic as its own entity comes from book seven, in which—trying to be spoiler-free here—a certain wand does a certain something, apparently of its own volition. The question there is: is the wand a semi-volitional creature in its own right, or is it magic itself that is volitional, acting through its own object? It looks to me like this could be taken either way, but the idea of magic as an animate power is an interesting one to explore. Explore away, fellow students! Chapter Twelve is a heartbreaker, y'all. But there's so much in it. Also, here's a pattern for making your own Weasley sweater. If you're not up for knitting one (I wouldn't venture without my mom or sister's help), you can also get them on Etsy, presumably handmade with love. Oliver Wood opens himself up to feminist critique when he turns to a team of seven young people in which both genders are represented and says "Okay, men." Feminist discussion frequently degenerated into serious brawling at The Hog's Head in its day, so I'm always a little hesitant about bringing up the topic. But this one touches on one of my pet peeves: gender neutral or gender inclusive language. It doesn't rhyme, AND it's a terrible cliché. Also, all of us who grew up with that hymn already have it ingrained in our heads the old way. Speaking of which, this ploy is worst when imposed upon Christmas carols. Everybody already has them memorized with the traditional lyrics. "God Rest Ye, Merry Gentlemen" is what it is, and it should be left alone. All that to say, linguistic inclusivism is a touch ridiculous when universally applied. But it's not a pointless concept, either. In Oliver Wood's case, I'm entirely with Angelina Johnson. 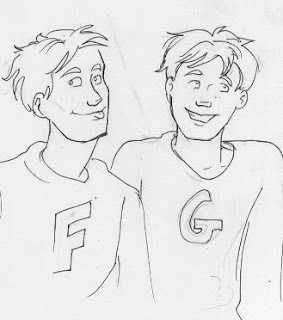 You can't just look at your Quidditch team, boys and girls together, and address them all with, "Okay, men." There's this little thing called tact. It's friendly. 1. The funny stuff. There's so much in these chapters, especially eleven, that's just so beautifully comic. I love Quidditch commentary—and this is just the start of it; wait till we get to book six. Also, I get a kick out of the fact that Hagrid bought the hellhound Cerberus off "a Greek chappie" in a pub and promptly re-christened him "Fluffy". 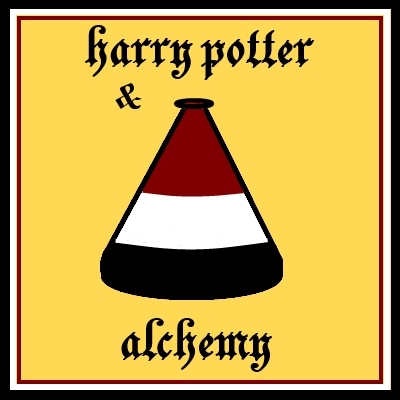 And then there's Fred and George, wizard chess, wizard crackers, and Hagrid's cooking. 2. Weasley family dynamics. We get more insight into them at Christmastime, with Molly sending Harry a family sweater—considering that she's met him just once, this is incredibly tender and perceptive of her—and Fred and George making sure Percy and Ron stick with the family spirit. Percy's resistance comes from a different place than Ron's, but both of them will pay for their withdrawal before the series is out. 3. Books in Harry Potter. The Restricted Section of the library is creepy and fun; the books, imbued with magic, don't just shut up and let themselves be read. I actually think Rowling could have done a lot more with this, but talking about that would mean spoilers for Half-Blood Prince. I designed this emblem for this discussion point. You can expect to see it a lot in future. Before I get started: Everything I know about alchemy, I learned from John Granger. Granger's primary sources are Lyndy Abraham and Titus Burkhardt, as I recall (other oft-referenced names include Jung, Lings, and Eliade). Of course, I may be an imperfect student and make mistakes, but I'll shoot as straight as I can. There's a lot to alchemy, so here's a basic summary—not of everything, but of the beginning salient points. B. The alchemist's Great Work entails refining the prima materia—a formless, basic matter, analogous with his own soul—into the Philosopher's Stone. He refines matter and soul simultaneously in the one Work. The rubedo or red stage, in which the reddening of the matter indicates success of the Great Work. 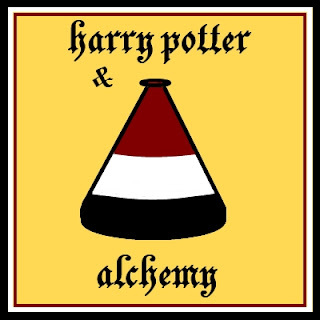 From the very title of this book—which Rowling and her U.K. publisher called "Harry Potter and the Philosopher's Stone," and Scholastic renamed "...Sorcerer's Stone" for American audiences—we see alchemical influence. The title, however, could just be a classic mystery title. The fact that Hermione Granger's initials form the periodic table symbol for mercury might have been coincidence. The colors dropped here and there in the book could just be colors. Or they might not be. The quarreling couple. Hermione is our cool, feminine Mercury, and Ron is our hot, masculine Sulphur. The two bicker constantly throughout each of the seven books. Their arguing often intensifies in the middle, during the build-up to the climax of the story, and the pair must always reconcile for the final phase of the story. Color progression. Each of the books takes Harry through all three stages (and the final three books are stages in and of themselves; more on that later). We're in the albedo stage now, in which white and silver are common colors; we've progressed from the trip across the "great black lake" to mirrors and silvery invisibility cloaks and snow and a generally paler tone to the story. There'll be much more to come about alchemy. This is just a place to start! 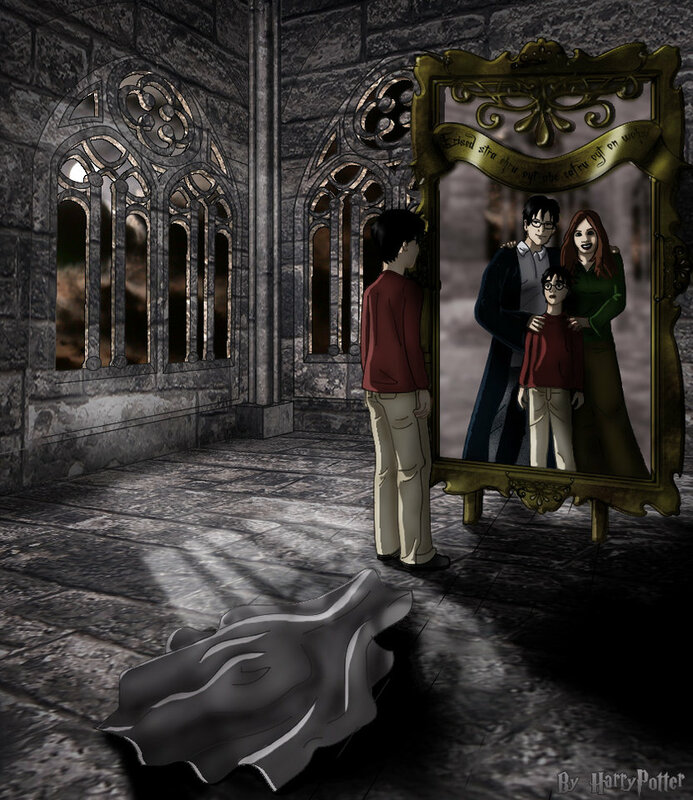 The Mirror is a tricksy thing, and probably a lot darker and more complicated for adults than for most children. (Harry, obviously, is not most children.) I expect that I'd see different things on different days... but I know what I'd see most commonly, and I know it would mean an explosion of tears, and I know it would feel like losing loved ones to turn away. What would you see? Answer aloud only if you're feeling brave. Harry and Ron make an interesting contrast here. 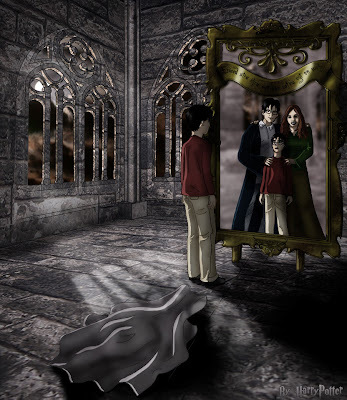 Harry sees himself with his family, and as Dumbledore put it, "Ronald Weasley, who has always been overshadowed by his brothers, sees himself standing alone, the best of all of them." I'd love to put both of their visions in context with Deathly Hallows right now, but SPOILERS. "The happiest man on earth would be able to use the Mirror of Erised like a normal mirror, that is, he would look into it and see himself exactly as he is." I've never quite bought this. It almost suggests an odd individualism, as if there's nothing beyond being satisfied with ourselves, which sounds like hell, in my opinion. I suspect I'm over-reading it, but there the matter stands. "It does not do to dwell on dreams and forget to live." 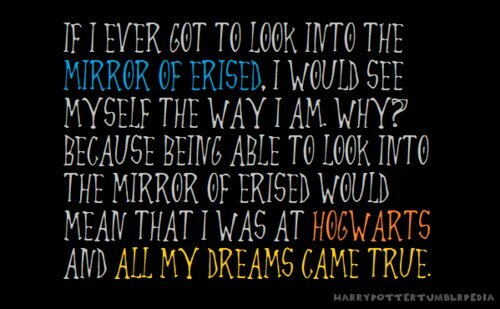 This is one of Dumbledore's most famous quotes, with excellent reason. 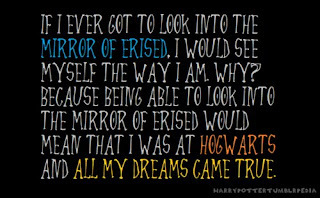 The Mirror is one of the most dangerous things Harry ever comes across. Always wishing for what you don't have is a means to immense regret. But I'm going to go out on a limb and hope it's not an Unforgivable Spoiler to say that Dumbledore. . . may not always be right about everything? Or even. . . . that it's possible that YAY SOCKS might not be 100% of what he sees when he looks in the Mirror? The generic “man” is a funny case because (like a lot of words) it used to be gender-neutral way back in the day, with optional gendering prefixes (werman / wyfman) but usage shifted over time, and now it's just another Masculine Generic. I guess it could theoretically become neutral again, in a couple hundred years, via increased use + wearing down of “human,” though in that case it might end up being pronounced “mun,” or “men” (or “humes”?). Query for those of you who didn't foolishly give away half their HP books in an attempt to clear bookshelf space: Is there a true general term for magic-users in the Potterverse that isn't gendered? 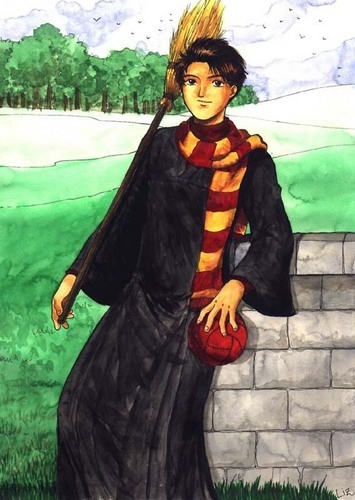 They seem to use “wizard” as a kind of Masculine Generic, but individual magic-users are always (? I think?) gendered as either wizards or witches, though they don't seem to learn or do anything differently magic-wise and even play on the same sports teams. (“Muggle,” on the other hand, has no gender markers at all). But I could be mistaken – I don't have all the books with me. Is there any non-gendered collective term for magic users in the Potterverse, the way in Muggle English you can say, “people” or “humans” or “folks”? And is it going to be Alchemically Significant if the answer is no? Only time will tell if I'll be able to muster the effort to learn enough about alchemy to participate in these discussions adequately. . . Am I going to have thoughts on the magic sentience question, though? Yes, probably! Great post! I can't think of a true general term for wizards and witches, either, and that actually kind of annoys me a wee little bit. The Masculine Generic "man" doesn't offend me in general use, but I'm not desensitized to "wizards", so yeah. Hagrid or someone might say "magic folk" somewhere, but then that's two words. And using wizard/witch as a gendered thing is a completely storybookish thing--I think in actual paganism, either gender can be either. "Gather Us In," isn't so bad, but I like minor key. I like gender-non-inclusive language for the most part..except occasionally, when I like terms like 'individual personhood' (a term my mother in law finds absolutely ridiculous and 'just wrong! '..which, I have to admit is half the reason I like using it around her ;) ). Have either of you hear the "Loud boiling test-tubes" 'hymn'?..It's one of my favorite really bad ones. I LOVED your thoughts on the personality of magic! More thoughts later..I'm sure..and the mirror - yeah. I think the IDEA is amazing, fantastic, dark and very richly magical..though the whole concept of "the happiest man could..." is problematic, but as Laura mentions..it may be merely earthly desires (which would make it sort of fun to contemplate St. Francis..or Mary of Egypt in front of the mirror..would they just see themselves??? Or would the mirror break with the force of their true desires?? Or, would they see their little earthly desires - like those cookies from Lady Jacoba that Francis totally loved?? I know what I'd see, and yeah - lots of tears would ensue from that little look..better to keep it far away! She does a good job showing the addiction of those little glimpses. I went and looked up your test-tube hymn -- I don't really have much basis for judgement . . . I guess it seems kind of repetitive & therefore long? It lists rather than builds. My first thought when I heard it was, "But there's no sound in space!" And I normally like the word "loud" but got pretty tired of it in this song. There are two versions of it, though -- one has "O victory, loud shouting army," in the first verse, another has "Hail, wind, and rain, loud blowing snowstorm." I guess the test tubes rub some people the wrong way, though the chemist in this comment thread likes them: http://afortmadeofbooks.blogspot.com/2008/07/tacky-hymns-2.html (Note: There's an unpleasant bit of surprise violence in that link). The test tube hymn!! Thanks for the link, Laura (OK, his friend can't really have karate-kicked him in the throat, could he? If he was sitting at the piano? Surely he made that up... I hope so...) I seriously laughed SO HARD at those lyrics. I admit I'm a lyric snob; half my own lyrics drive me berserkers nowadays. But I was cringing at the word loud by the time I got to the end, and I had the same basic thought over the "loud rushing planets." The alchemy thing is fun for me. I like the connection to literary classics and the idea of soul purification, and I find it super helpful for plotting my own novels. :P But you can get by reading Harry with no concept of it whatsoever. Actually, once I went to try and explain it, I realized how muddy my own understanding is. Probably need to pull out Unlocking Harry Potter again if I'm going to keep going with discussions on it, which I totally am because I find it so fascinating. ;) Anyway, if you have questions or confusions that you want cleared up, let me know and I'll do my best to address them, either right away or at appropriate points in the story. "Individual personhood" really doesn't work in an artistic sphere at all..I'm 100% with you there - the altered songs also have the problem of causing half the church to sing along with the lyrics they grew up with, and the other half to sing along with whats in the book..then everyone gets confused and falters on the next three lines or so..:p - not fun! I think Seth has some Alchemy thoughts to share this time..his mind doesn't go all fuzzy with the thought of it! I'm just fascinated with the idea of a person so obsessed with doing alchemy that I can't really think about the symbols yet so much as just imagine a long-fingered, feverish-eyed old man chuckling about prima materia turning all sorts of pretty colors ;)..It's progress though, right? btw..THANKS to George for showing me how to use italics and bold in the comments!!! It's so much more fun this way! I think I've finally come on board the "J.K. Rawling used tons of alchemical symbolism in her books" train. There's a lot going on there, but I wonder if it's too much. With such a heavy reliance on the progression of alchemy, it's goals and concerns, her characters seem to become locked in a certain pattern of behavior. Ron and Hermione can't not be the "quarreling couple", SPOILER can't not SPOILER, and SPOILER must always SPOILER. This is a downside of using alchemy to run your novels; instead of using the template as a guide she seems to desperately infuse every single action, color, chapter title, name, and characteristic with massive symbolism from which they cannot escape (at least if half the essays from "Harry Potter for Nerds" are on the right track). Granted, I knew none of this when I first read the books so obviously there is merit there. Rawling does avoid being too over-bearing or preoccupied with ensuring her reader knows each and every detail that went into her thought process. This is something that a great many authors don't bother avoiding, so kudos to her for that. 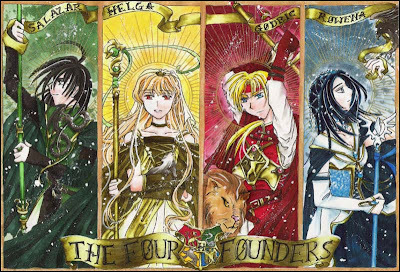 With such a heavy reliance on the progression of alchemy, it's goals and concerns, her characters seem to become locked in a certain pattern of behavior. That's a fair criticism, and for all my love for the books, I sympathize with it. I think that weakness shows up in parts of Deathly Hallows, especially. The Quarreling Couple were arguably better handled in the DH movies than the book. I fear I'm one of those annoying people who explains exactly what the names mean, and why. :P They're just so fascinating! And now I'm going to be racking my brain to see if any of the more evocatively-named characters changed in real and obvious ways. Filch is certainly an unfortunate old spoiler. But what about Juliet? Would she be discouraged because her name means "downy-bearded", or because she wanted to "no longer be a Capulet", or what? I'm all curiosity. Because "what's in a name"?! Ha, whoops. I totally forgot that line came from that play. Thanks!! Oh, and speaking of, I think it IS a bit problematic that it's called the "Wizarding world." Linguistically, It sounds great, and I don't really mind men and women being labeled separately as witches and wizards. But to openly and specifically label the magical community as Wizarding is troubling. Travis Prinzi has a chapter in "HP and the Imagination" called the "The Witching World" and he delves into this a bit : "The fundamental argument of this chapter is, that while certain stereotypes are reinforced and certain traditional hierarchies observed, there is an underlying feminism to the series that is set in the context of a male-dominated society, making it an effective commentary on our own" (259). I think I agree, and that "Wizarding" is a bit like the world "man" in our own muggle world. I like non-gender-inclusive language as well. Anything that is more varied and flavored. It makes language beautiful. On the down side, the varied meanings can be problematic. The connotation of the word "witch" is different from that of "wizard," and summons different Platonic ultimates in my mind. In my own personal mythology, they're not the same kind of being at all. I would have preferred wizard and wizardess. I hadn't thought about this much, but Seth and I were talking about it today and you're really very right on .. I think Rowling manages to make it work, but it's a complete adjustment. Re alchemy: I've stated this before on SSiG once. I feel like alchemy can be found just about anywhere because the very concept of it is woven into nature and being. Not that Everything Is Alchemy but that alchemy just isn't that "new" or "ground-breaking." The concepts of purification and transcendence are universal and primeval. Am I wrong? I mean, it's certainly not all there is to write/talk about, but it's a pretty significant characteristic of human nature to think of things in terms of duality, etc. I think you're absolutely right. I can even look back and recognize the alchemical progression in my own life in places--I think that cycle of burning and washing/cleansing and renewing are natural to human existence. As you said, universal and primeval. Which might be why Rowling has said this: "I've never wanted to be a witch, but an alchemist, now that's a different matter." I think the basic concepts resonate, and that's why it works so well as story scaffolding. You can read a story structured on it and have it ring true even if you don't know anything about alchemy. Conversely, a writer who tells a basic three-act story may know nothing of alchemy and yet a reader who knows what to look for may see some underlying parallels, just because it is so natural. And it's not alchemy, in the end, that matters. It's that search for purification and transcendence.